At the Democratic National Convention in Philadelphia last month, depending on which watering hole you wandered into, you could be forgiven for thinking that you were at an Irish political gathering. Frances Fitzgerald, Tánaiste and Minister for Justice and Equality; Martin Hayden, the Fine Gael parliamentary party chairman; Mark Kenneally, Enda Kenny’s chief of staff; and Jerry Buttimer, leader of the Seanad, were all present; as was Michael Lonergan, Ireland’s deputy head of mission at the Irish embassy. Thomas Byrne, the Fianna Fáil TD for Westmeath, brought up the rear. If there were anyone left in the Labour Party, no doubt they’d have been there too. And inside the convention there were Irish flags flying above the broadcast network news boxes as Irish ‘Friends of Hillary’ made the trip to celebrate her formal nomination as the Democratic candidate. Aside from the lonely passion of Alice Butler-Short, a 73 year old expat from Tipperary who claims to have harnessed the support of 1,000 Irish American women for Trump, there wasn’t much evidence of an Irish presence at the Republican convention. Then again there wasn’t much evidence of a Republican presence at the Republican convention, which resembled a collision between a cage fight and a Ku Klux Klan outing on laundry day. Indeed, the combined Trump For Ireland Twitter accounts can only scare up less than 500 followers between them. But if you have been under a rock for the past year, this is not a normal election. And Kenny is by no means the only international leader to condemn Trump. There is a school of thought that suggests if Trump becomes president it may all be moot because Ireland – along with the rest of the planet – runs a reasonably good chance of being reduced to a charred husk even before the brass Trump logo is affixed to the exterior of the White House. This is a view that is taken by a significant number of Republicans, 50 of whom penned a near apocalyptic warning of the global dangers of a Trump presidency. But even a stopped clock is right twice a day, and Trump correctly pointed out that a significant portion of the signatures came from those who masterminded the dismal 2003 flop that was Iraq II. Few battle plans survive contact with the enemy: even fewer presidential battle plans fewer survive contact with Congress and the Chiefs of Staff. If Trump does become president, the most lasting damage will likely be to the US’s reputation and it’s social fabric. The markets will probably fluctuate and eventually recover, capitalism will survive more or less intact, and it is highly unlikely, despite his threats and promises, that a wall will be built between the US and Mexico, or that Muslims will be banned from entering the country. It is also highly unlikely that his pledges to wipe out Isis will do anything other than boost its recruitment. But how will the next presidency impact Ireland? The reality is that, regardless of who is elected president, Irish issues will be very close to the bottom of the next president’s agenda. A straw poll of the Congressional Friends of Ireland – members of Congress who have pushed the Irish agenda for decades – suggests they see this as mostly appropriate. Just as a recovered patient shouldn’t complain when the doctor stops visiting, the Irish should take it as a positive sign that it is no longer on the Oval Office ‘to fix’ list. I recall an exasperated foreign policy adviser to Ted Kennedy suggesting: “It’s time [for Ireland]to put away the begging bowl” at an Irish Embassy event back in 2002, while other Congressional Friends of Ireland, also lost patience with those lobbying on behalf of undocumented Irish immigrants in the early 2000s. “You want us to make a special case for those fleeing the biggest economic boom in Irish history?” one asked. Whether the next occupant of the White House is Clinton or Trump, either is likely to introduce policies that could adversely impact the Irish economy. The Oval Office in-tray will probably include the implementation of economic recovery policies that could have a negative impact on Ireland. Moves to block US corporations from stashing profits in tax-friendly regimes like Ireland are likely to be pushed through in the next four years, regardless of who is elected. In 2015, Citizens for Tax Justice and the US Public Interest Research Group published a study that concluded the 500 largest US companies held more than $2.1 trillion in accumulated profits offshore to avoid US taxes. Were these funds repatriated, they would owe the US Treasury around $620 billion in taxes. In Hillary Clinton’s case, her policy towards US corporations that stash profits in low tax jurisdictions are likely to be a continuum of Obama’s – ie, heavy on restrictive regulation and unlikely to induce much change, other than to deter such activities by corporations who haven’t already availed of this legal form of tax avoidance. Obama’s interest in Ireland – aside from the mandatory “hunt your ancestors” visit – has been limited to hosting the annual St Patrick’s Day “shamrock reception” at the White House, a green-hued dog and pony show that has become little more than a photo op. In fact, you could argue the Obama administration has been the least useful modern US presidency in terms of its net benefits to Ireland. While the regulations introduced by Obama are credited with blocking the Pfizer/Allergan inversion, Obama himself acknowledged that legislation was necessary to ensure that US firms are brought to heel. In Trump’s case, if he can push through his pledge to provide a one-time 10 per cent payment on all overseas earnings, it would yield as much as a $200 billion boon to US coffers, and around $300 billion a year thereafter. A significant portion of this, if his projections are accurate, could come at the expense of Irish jobs and tax revenues. But these estimates don’t take account of cheaper labour costs and government incentives in other jurisdictions aside from lower tax rates. Trump claims his proposals would not just dissuade future corporations from US following the well-travelled path to Ireland, but could entice many to reverse decisions to shift overseas profits to low-tax jurisdictions like Ireland. On immigration, neither candidate envisages any kind of specific action by future administrations that would benefit Ireland in terms of immigration. Any attempts by Clinton to introduce the sort of widespread immigration reform that would indirectly benefit undocumented Irish workers is likely to meet with fierce resistance from Republicans, who currently control the House of Congress and the Senate. Unless she wins with a significant majority in both houses – an unlikely scenario – no meaningful immigration reform is likely. Should Trump become president, the scenario is grimmer. While he is known to import low-paid workers for his resorts on short-term visas, his draconian immigration policy is likely to result in a reduction in the number of green cards and visas issued from EU countries. And his exhortations to Britons to ‘take their country back’ and his support for Brexit suggest a destabilising disinterest and distaste for the EU. Regardless of who becomes president, there is no future Morrison Visa programme in the offing. Illegal immigration is a hugely contentious issue and the current mind-set in the US suggests that those who flout US immigration laws should not be rewarded with green cards. The notion that a ‘special case’ should be made for undocumented Irish immigrants currently living and working in the US is anathema to even the most sympathetic Irish supporters, in the current environment. 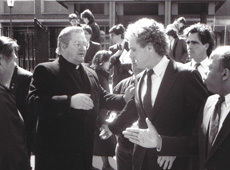 There is a myth – largely propagated by Irish American lobbyist groups – that there is an Irish American voting bloc of 44 million that will be awarded to the candidate with the best pro-Irish credentials. The perpetrators of this myth claim that vote can be harnessed by the candidate that offers the best ‘deal’ for Ireland on issues like immigration, investment and Northern Ireland. No such bloc exists. Firstly, Irish-Americans vote for the same reasons that other Americans vote – they support the candidate that they feel best represents their interests and beliefs, not those of relatives in another jurisdiction that they may not have seen for decades. Secondly, the vote of those with Irish American ancestry is split more or less evenly between Democratic and Republican parties. Around one in four members of Congress and the Senate claims Irish ancestry. This is split between the Democrats and Republicans more or less equally – with signs that the proportion in the Democratic Party is shrinking. Despite this, none of the 17 Republicans who sought the presidency has a record of support for Irish interests. Fr. 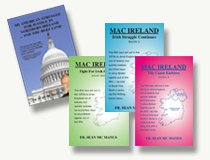 Sean McManus, who founded the Irish National Caucus to lobby the US Congress in 1974, has spent more than forty years observing the evolution of US-Irish relations at very close quarters. He recalls when congressional hearings on Northern Ireland were banned, a position that remained through the Carter, Reagan and Bush administrations, despite strenuous attempts by Congressional Friends of Ireland, a bipartisan lobbyist group, to have the ban lifted. There is certainly Irish representation of sorts on both sides of this election. Clinton’s running mate Tim Kaine is an Irish American who is a frequent visitor to Ireland. The current vice-president Joe Biden rarely fails to invoke his Irish ancestry in any public or private utterance. Several of Clinton’s closest advisers – including Jake Sullivan and Bobby Mook – claim Irish ancestry. Stephen Bannon, the Trump campaign’s new chief executive, who has been dubbed “the most dangerous man in America” by Bloomberg News, describes himself as “an Irish-American who came from a long line of Kennedy supporters and Democrats”. Peter King, one of Trump’s most ferocious surrogates, has a long history of interest in Irish affairs. King is an interesting case study of the journey that a career politician can make in a lifetime. This hitherto moderate Republican Congressman from New York, a member of the Congressional Friends of Ireland for more than three decades, was one of Ireland’s staunchest allies in Washington. An affable and accessible figure, he corralled essential bipartisan support for the Clinton Peace Process initiative in the face of some fierce Republican resistance. He was also of the few Republicans in Congress to vote against Bill Clinton’s impeachment. Now he is one of Trump’s most visible and vocal lieutenants, flanking him alongside Rudy Giuliani during last week’s surreal, Apprentice-style televised security meeting in Trump Towers. In the process, King has become one of the fiercest opponents to any form of amnesty for undocumented immigrants; he recently told me that his support for Trump stems largely from his hardline approach to immigration. Clinton, of course, has well documented pro-Irish credentials. Her role in the Northern Ireland peace process has been variously criticised and praised. But a significant number of people directly involved in the process have praised her contribution and commitment to this reporter – King, Ben Gillman, Monica McWilliams, Liz O’Donnell, John Connorton, John Hume, Gerry Adams, Bertie Ahern and Martin McGuiness amongst them. It is a matter of record that the Clinton White House, vigorously prodded by Ted Kennedy and patiently midwifed by George Mitchell, was instrumental in delivering the peace process. After the Clintons departed, there was much handwringing about the future of the process under George W Bush. But some Republican members of the Congressional Friends of Ireland convinced Bush that at this point in the process, there was a lot of gain and very little pain to continuing Clinton’s investment. The appointment of Richard Haass as special envoy, initially received with some scepticism in Irish diplomatic circles, turned out to be exactly what the stuttering process needed. US investment in Ireland continued unabated and – if you can overcome the distinctly queasy feeling that comes with allowing your airports to be used as rendition and refuelling stop-offs in an illegitimate and globally destabilising war – the Bush presidency was a lot more useful to Irish interests than many had anticipated. Proving once again that benefits don’t always accrue along party lines. But perhaps we’re asking the wrong question when we wonder how the next administration will benefit Ireland. Flourishing economic and political relations between Ireland and the US should no longer be contingent upon the sentimental recollections of Irish-American politicians. As immigration from Ireland stalls, each generation of Irish Americans will have fewer direct links or contacts to Ireland. It is time for more lateral thinking and to build lasting cultural, corporate and political connections in less traditional ways. The US-Ireland Alliance is a case in point. The networking group, which funds a prestigious scholarship programme that ensures two dozen or so of America’s future leaders will spend at least one year pursuing advanced studies in Ireland, is just one manifestation of how future goodwill and contacts between Ireland and the US are fostered. There have been successful signs that the seeds that have been planted by independent actors are bearing fruit in ways big and small. The US-Ireland Alliance’s Mitchell Scholarship programme is one of the more innovative products of this. If the US’s future political, corporate and cultural leaders spend a year or two studying in Ireland, they are likely to form the sort of organic personal and cultural bonds that will influence their thinking when they reach the corridors of power in Washington or the corporate world. A concrete example of the benefits reaped by such active networking was the decision by Star Wars: The Force Awakens director JJ Abrams, whose wife Katie McGrath is on the board of the Mitchell Scholars programme, to film its penultimate scene on Skellig. The movie – which has grossed almost $4 billion since its release, including $1.5 billion in the US – has given Ireland the sort of exposure, both as a location for film and a holiday destination, that multimillion-dollar advertising campaigns could only dream of. Just as important as shining a spotlight on Ireland, both as a film location and tourist destination, says Trina Vargo, president of the US-Ireland Alliance, is the opportunity for emerging and established Irish filmmakers and actors to get networking opportunities through the Alliance’s extensive contacts. These will enable access to heads of studios like HBO, Lions Gate, Paramount and Warner Brothers, with a view to helping fund and bring their projects to international audiences. The old model of US-Irish patronage is obsolete. Time for a new way of thinking.